This entry was posted in Investing and tagged 7million, 7million7years, Investing, retirement by Adrian. Bookmark the permalink. A true dividend investing approach isn’t just blindly investing in dividend stocks(unless you want it to be). An approach I like is breaking it down based on equal percentages and adjust the % based on where you are. I am still fairly young so a large portion of my dividend investing is with companies that are increasing their dividends and are more growth oriented. 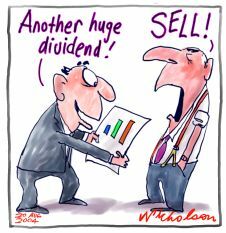 The dividend dollar amount per share is fairly low but they increase their dividend year after year and have room for appreciation(focusing on total return). I also have a % that are more in value plays or companies that pay a dividend but also have fallen out of favor. 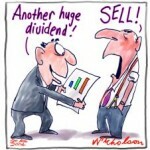 Third, is stocks that pay a higher % dividend. And last are pure growth stocks(no dividend). Mixed in with a good quality bond mutual fund(I personally don’t want to learn how to invest in bonds). Now being fairly young real estate interests me and something I plan on getting into but I have a fairly full plate as it is right now and my first residential RE deal I would prefer to buy with 90% down. I run a web hosting business(recurring predictable revenue, hands off outsourced support) and also have a few websites where I earn decent money from selling adspace (auto pilot by paying writers). Plus I work a full time job. I know my plan isn’t 7 mil in 7 years(or whatever number). But it hinges on slow consistent growth, compounding and monthly cashflow(reinvested). Not saying I am right, just saying it is right for me. @ Deek – Thanks. So, if you’re not interested in $7m7y (or some other Large Number / Soon Date) what brought you to my blog? Your path is actually quite parallel to mine, so I’ll ask you a second question: since you have other income (FT job + web business), what do you intend to do with the dividends? Not that I am not interested in 7 mill 7 years (or whatever number). I am just fairly conservative investing wise. I also want to keep things fairly simple. Right now if something happened to me I think my wife could manage everything and still do fairly well. I ran across your blog somewhere and stop by every few months to see what is new. Dividends are all reinvested I have them go into the “holding” portion of my trading account until one(or a few) of my dividend stocks dip then I put in the buy order. 2009/10 was a record year for me personally catching the upswing from the 2008 fallout. Just about everything extra over basic living expenses is reinvested either in the hosting biz, stocks or building out my websites. Whichever at the time I feel will get me the best ROI. I am expecting to get to a point where things really start to snowball and grow bigger and bigger faster. Only time will tell. But, I can’t help wondering: being “fairly conservative investing wise” is a tactic; so is being aggressive; so is investing in dividend stocks and all the other stuff that you mention. What if ‘time doesn’t tell’? What if you get to a certain point in time, and say: “my tactics didn’t work well enough” but you run out of time to change tack? You see, if you haven’t already done so I feel that you need to work backwards: know exactly what your Number/Date is; spend some time with an online calculator; iterate the two until you’re happy …. i.e. adjust any combination of your Number, Your Date, Your Tactics until you ARE happy. After thinking about this some more, I think you should read “Active Value Investing in Range Bound Markets”. It talks about range bound markets being what happens between bull & bear markets – often lasting a decade or longer, and stock market returns are basically flat after accounting for inflation. The stocks that do best in that environment are low P/E ratio, solid dividend yield stocks. Since I believe we’re in or about to be in a range-bound market that’s why I like dividend paying stocks right now. Oh yea, a word of warning: It’s a terribly boring book. “The Little Book of Sideways Markets” is the same basic theme by the same author, and is presumably a much easier read.